Want a no-fuss makeup look you can trust 100%? A big deadline is looming, you have plans every night and a million other jobs on your to-do list. We get it, you’re feeling a little frazzled (and fair enough, too). But the good news is you can still look sleek as anything. SuperStay has got your back so you can slay all day. PUMA x Maybelline fuses beauty, fashion and sport into one high-performance makeup collection. In short, it’s everything your makeup bag has been missing. Call us Cupid because this Valentine's Day, Maybelline is playing matchmaker! We've paired up all of our beauty favourites, so read on if you're ready to find your makeup soulmate. Read on! New York is the place to suss out all the latest high fashion tends. Rowi’s pick of places? The Discount Universe Showroom for looks from fab to Lizzy Maguire-esque. Truly what dreams are made of! Stopping for wine and cheese is basically a necessity, Rowi can you bring us home a platter, please? New York City is an Instagrammer’s dream. The Fairy Island Pop-up is full of lights, confetti, feathers and cool art installations. You can’t leave without getting the perfect gram! Throughout a hectic day of adventuring, guess what survived? Rowi's Superstay Matte Ink lipstick! Holographic makeup is THE summer trend, letting you get all the iridescent shine. It’s a whole new dimension with new products to match. We're off to the races! This season is about glowy makeup that lasts all day, so let Bronte show you her go-to glam look that's sure to beat the odds on style. For a showy smoky eye, start with neutral shades from the Burgundy Bar Eyeshadow Palette. Use it as a transition shade for your lid and crease. Then blend, blend, blend the rich gold tones into the outer corners for added depth. Finish up with the Master Chrome Highlighter for extra pizzazz! Here, we're going soft but shimmery. Use the Master Contour Palette to chisel those cheekbones and add some bronze coverage. Dab on Dream Matte Blush in Flirty Pink for naturally flushed cheeks before topping it off with some reflective highlights from the Master Strobing Stick and Master Chrome. Now you're on the home stretch, go bold with gloss and opt for a Vivid Hot Lacquer pout in Sassy. Obsessed with a product and want to tell the world? Submit a review today! Timeless, yet very now. Fresh but still kind of girly. Read how to achieve this classic, dusty rose look this spring! 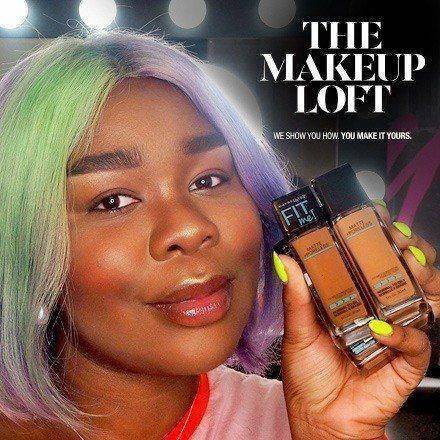 Explore our favorite content from our Makeup Loft Girls! 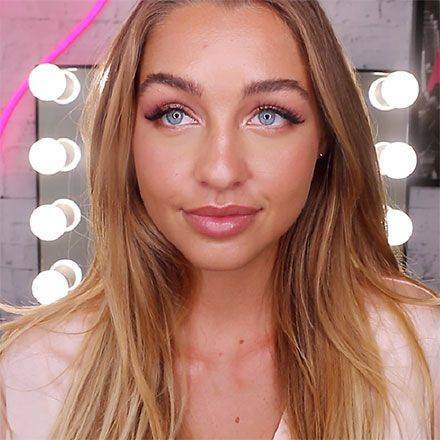 Claire shows us how to cover-up breakouts with makeup! If you’re after a smokey eye look that won’t take all night to perfect – girl, you’ve come to the right place. 1. First, take Color Tattoo in Inked in Pink and pat it all over your eyelids. Its cream gel formula is easy to apply, so a finger is all you need! 2. Next, dip a fluffy brush in Color Tattoo Leather in Creamy Beige, swirl it around and lightly dust your outer corners. 3. Use HyperSharp Winged Liner to draw a dramatic wing. 4. Finish it off with a sweep of Colossal Big Shot Mascara! Quick, easy and totally fabulous. Chase away the winter blues by embracing shades of pink. Feminine, fresh and easy to wear, it’s the IT colour this season – and for good reason. Got a sudden lust for blush? Fit Me Blush offers true-to-tone colour that looks gorgeous and glowing all day. Simply sweep onto the apples of your cheeks from your cheekbones to your temples. Trust us, you’re going to want this type of pink eye. From matte to metallic, pink eye shadow pops on paler complexions while darker skin tones look amazing with more pigmented or shimmery options. The Blushed Nudes Eye Shadow Palette is expertly curated with dazzling colours infused with rose gold pigments. There’s no such thing as one-size-fits-all when it comes to a pink lip. A low-key coral shade suits everyone, but if you want to amp it up, try Color Jolt Lip Paint with its 1000-watt shine in electrifying shades like Never Bare and Fight Me Fuchsia. Want to tone down the gloss? Opt for Superstay Matte Ink, a long-lasting matte liquid lipstick in saturated shades Dreamer and Romantic. Get the latest tips & tricks from the megababes that know beauty best. Rowi: Lipstick or gloss for touch-ups. Flex: Lip balm! Anything that moisturises. Rowi: 1920s. It was very poised and the hair is all slicked back. Flex: 1950s for ease of accessibility, but 20s for appreciation of time and detail. Senay: 1960s. Just the classic lip. Your best brows are just a sweep away! Let us show you how to define, shape and tame your brows. Accentuate your eyes with chromatic colour and illuminating jewel tones. Our Crème Color Tattoo eyeshadow range and Master drama nudes liners are the key to achieving that shimmering festival inspired look you've been eyeing off since Coachella! Click through for eyes that cut through the crowd. Conceal your way to a sculpted face! This all cream approach is perfect for achieving a radiant finish as the concealer base ensures a contour that won't budge all day. Strategically apply a darker shade to hollows of the cheeks and outer nose and a lighter shade to the undereyes and bridge of the nose. Blend blend blend and you are ready to set and forget with the Master Concealer range in array of carefully curated shades. Maybelline New York® is for the girls who Make IT Happen. For the girl who looks in the mirror and sees the power of possibility, and the value of her dreams. The girl who put on her strong face, and doesn't take no for an answer! We're having a serious blush crush moment! Embrace the flushed look as blush and highlighter creeps higher up cheeks this season. Typically applied on the apple of the cheek, now sweep blush and highlight in a c shape up around the brow bone and down around the high points of the cheek. With the Master contour pallette an everyday rosey hued glow is made easy, click through to release your most radiant self.